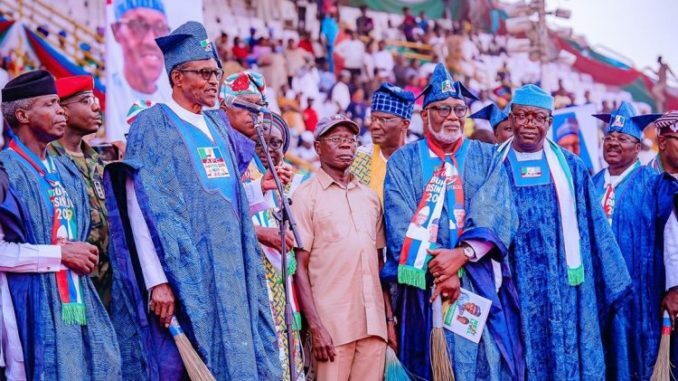 All Progressives Congress (APC) presidential rally held in Abeokuta, yesterday, ended abruptly, as stones and other hard objects were hauled at the rostrum where President Muhammadu Buhari, his deputy, Yemi Osinbajo, the National Chairman of the party, Adams Oshiomhole and other leaders of the party sat. The missiles started to fly into the VIP section, when president Buhari was about to officially present party’s flag to APC’s governorship candidate in Ogun State, Dapo Abiodun. Security details had to form a ring around the president to save him from being hit by the missiles hauled from the crowd on the football pitch of the stadium. The anchor of the event and Special Adviser to the President on Diaspora, Abike Dabiri, had to close the rally by calling for the National Anthem. Earlier, scores of angry crowd, suspected to be members of the Allied People’s Movement (APM), had chased supporters of the APC governorship candidate in Ogun State, Dapo Abiodun, out of the venue of the event. Tension had started to mount at about 10:00a.m when supporters of Abiodun, dressed in yellow and orange vests, began to chant pro-Abiodun song, to the chagrin of APM supporters, who also thronged the MKO Abiola Stadium, for the visit of the president. The supporters, who also engaged in a show of strength and test of popularity, almost engaged in physical confrontation, but for the quick intervention of security personnel at the venue. But, the peace did not last, as the hoodlums began to throw missiles into the stand of Abiodun’s supporters. In the melee that followed, several people sustained injuries, while several scampered out of the venue for fear of being hurt. The hoodlums, who were calling on APM members to occupy the seats vacated by Abiodun’s supporters, also forcefully removed the yellow caps worn by the loyalists of the APC candidates. Sporadic gunshots by the suspected hoodlums also rented the air outside the venue of the rally. Security at the venue had been tight as people were being thoroughly searched by stern looking security personnel, before gaining entry into the venue, until the state governor, Ibikunle Amosun, mounted the rostrum to complain about the tight security, which, according to him, had prevented his supporters from gaining entry into the venue. The governor’s outburst, however, made the security personnel relax and crowd of people surged into the venue, without being searched any longer. Meanwhile, four persons were arrested by the police outside the gate of the stadium, with dangerous weapons such as axes, machetes and charms on them. The president, who arrived the venue of the rally at exactly 3:00p.m, accompanied by his deputy, Yemi Osinbajo, APC National Leader, Asiwaju Bola Tinubu, Minister of Transportation, Rotimi Amaechi, governors of Oyo, Ondo and Ekiti states, Abiola Ajimobi, Rotimi Akeredolu and Kayode Fayemi, respectively, immediate past governor of Osun State, Ogbeni Raufu Aregbesola and former interim national chairman of APC, Bisi Akande, was driven around the stadium, acknowledging cheers from the crowd. Speaking, Governor Amosun, assured president Buhari of massive votes on February 16. He said Buhari deserved to be re-elected because of his performance, noting that the home grown feeding programme, N-Power TraderMoni and other social security net programmes of the president had endeared him to Nigerians. Amosun, who charged the youths to secure their future by voting for Buhari on Saturday and maintained that the president will be re-elected in a landslide victory, however, said he would let them know who to vote for during the governorship election on March 2. Also speaking, Amaechi urged the people to vote for the president and other APC candidates, in order to continue to enjoy good governance of the party. In his short remarks, Aregbesola said members of the party should not be hypocrites, but stand with APC all the way. He also charged the crowd to vote massively for the president and Dapo Abiodun as governor. Also speaking, Oshiomhole said the party was in the state to solicit support for the re-election of president Buhari and all the APC candidates in the state. Oshiomhole, who was booed by the crowd and narrowly escaped being hit by stones, hurriedly presented APC flag to Abiodun. Vice president Osinbajo said Buhari’s re-election would usher in employment for the youths, increase power generation and ensure more financial empowerment for women and traders. He implored the people to vote for the president and Abiodun as Ogun governor. In his speech, president Buhari thanked the crowd for defying the hot weather to come out in large number to listen to him and his party. He said the electoral promises APC made in 2015, particularly, in the areas of economy, security and and fight against corruption, have been fulfilled by his administration. He urged the people to come out, on Saturday, to re-elect him as the president. “I admonish you to perform your civic right on Saturday by voting for me, and on March 2, you are free to choose whoever you like across the parties. “It is your right, so, there’s no problem about it; I’ve no problem about it,” Buhari said. Meanwhile, the Peoples Democratic Party (PDP), yesterday, said the public pelting and jeering at president Buhari and Oshiomhole, at the APC campaign rally in Abeokuta, symbolises a rejection by Nigerians. The PDP, in a statement by its National Publicity Secretary, Kola Ologbondiyan, said Buhari’s tenure has been characterised by increase in poverty, corruption, divisiveness and bloodletting in the country. The opposition party urged the president and the ruling party to read the hand writing on the wall and get ready to accept defeat in the February 16 presidential poll.